Opened in 2011, Buffalo Camp is located 50 miles south of Malta and 4 miles north of the Charles M. Russell National Wildlife Refuge. Situated close to a variety of recreation opportunities, the campground features 13 sites (6 tent and 7 RV) and provides non-potable water, vault toilets, and an amphitheater for $10/night (without electricity) and $15/night (with electricity). Travel to Buffalo Camp is on gravel and unimproved roads. Tent sites have large, low-impact platforms with tie-down cleats. All tents must be set up on the tent platforms. In addition to an information kiosk and two group pavilions with tables, you’ll also find a 1-mile hiking trail, geocaching opportunities, and a prairie dog town nearby. Buffalo Camp is open year-round and reservations can be made online! Of the 13 campsites, two tent sites and two camper sites are available on a first-come, first-served basis. No refunds will be provided. Rebooking is available for inclement weather, based on availability. 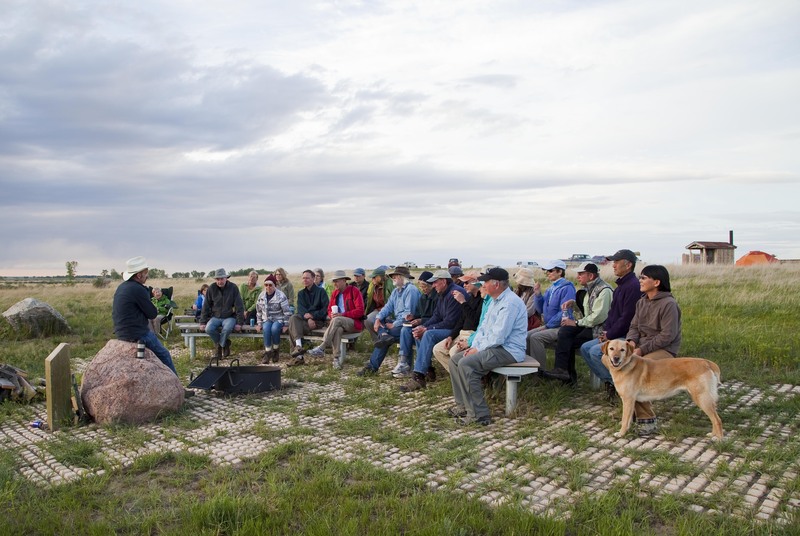 For questions and group stays, please contact us at visit@americanprairie.org or 877-273-1123. Download the Buffalo Camp Brochure for additional details and driving directions. More travel information is available here. Buffalo Camp is a NO SHOOTING area. Use the “Iron Ranger” drop box for camping fees & comments. Maximum stay is seven days. Quiet hours are 9PM to 7AM. Generator hours are 11AM to 2PM only. Do not approach or feed wildlife and bison. Fires only allowed in fire rings. Wood gathering allowed; no cutting of standing trees. The Reserve encourages all visitors to follow Leave No Trace principles during your trip, including during your stay at Buffalo Camp. Bringing horses to the area? Learn more about camping with horses. 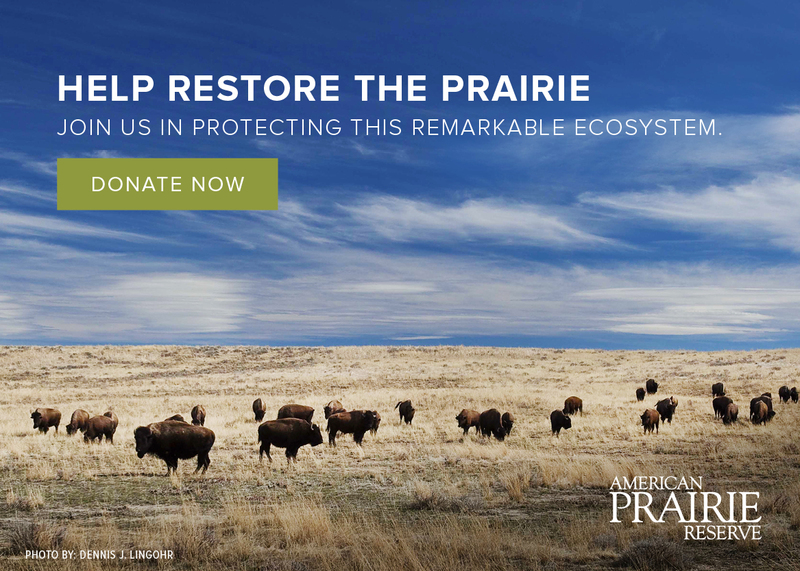 American Prairie Reserve is working to offer a boundless nature experience for all walks of life. Learn about how to visit and what to see and do during your trip. Visitors to Buffalo Camp start the day with brilliant sunrises and watch as the afternoon fades behind the Little Rocky Mountains. You can now make online reservations for your stay at Buffalo Camp, the Reserve’s first public campground. Thanks to your support, we have added a few upgrades to Buffalo Camp to make visits easier and more enjoyable! Tents and pull-behind trailers have started to pop up at Buffalo Camp, providing temporary homes to intrepid visitors. Thanks to funding from the Swedish Postcode Foundation, visitors to Buffalo Camp will find new resources to guide you through your visit. To help you plan your trip to the Reserve, we’ve rounded up four of the best trip resources for self-guided explorers.